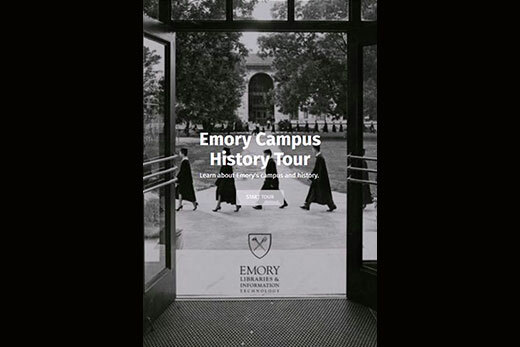 A screenshot of the new Emory Campus History Tour homepage. 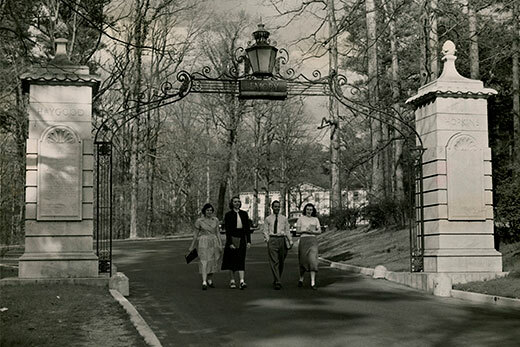 Dedicated in 1937, the Haygood-Hopkins Memorial Gate stands at the main entrance of Emory University's main campus. 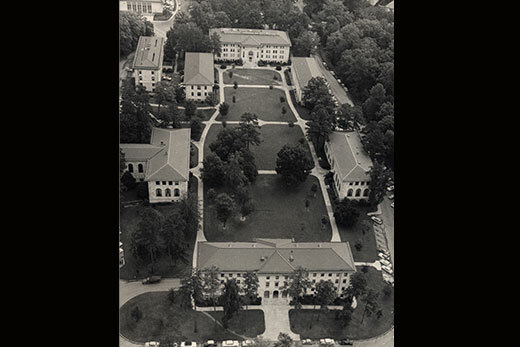 This photo was taken around 1949. Credit: Emory University Archives. "Atlanta’s Living History," a panel discussion with Emory historians and researchers in connection with the launch of the Emory Campus History Tour, is Saturday, Sept. 19, from 1-2 p.m. in the Jones Room on Level 3 of the Robert W. Woodruff Library. The event is open to the public at no charge. OpenTourBuilder workshops will be offered at no charge on Sept. 22 and Sept. 23 in ECDS, on Level 3 of the Woodruff Library. Participants can register on the workshops page to learn how to build their own tours on the OpenTourBuilder platform. Two Emory Libraries fellows have combined history and technology to create a tour of the Emory University campus and Emory Village that is accessible by smartphones and tablets. The project launches with a panel discussion set for Saturday, Sept. 19, from 1-2 p.m. in the Jones Room on Level 3 of the Robert W. Woodruff Library. "Atlanta’s Living History" is presented by Emory historians and researchers and open to the public at no charge. Panelists include Gary Hauk, vice president, deputy to the president, and Emory historian; Sally Wolff-King, senior editor of health publications at the Emory Clinic and adjunct faculty at the School of Medicine; Leslie Harris, associate professor in the Department of History; and student NaVosha Copeland, a senior in interdisciplinary studies in History, Society, and Culture. The Emory Campus History Tour uses historical materials housed in the Manuscript, Archives, and Rare Book Library (MARBL) to lead visitors on a directed mobile tour of the historic Druid Hills campus, which was deeded to Emory in 1915. Maps, video clips and images combine with the narrative to tell a story of the campus and its development throughout the 20th century. Matthew Strandmark, a research library fellow working in MARBL, and Anne Donlon, a postdoctoral fellow with MARBL and the Emory Center for Digital Scholarship (ECDS), co-developed the mobile application, which is web-based and does not require a download. The tour is designed for a variety of audiences, including one-time visitors, prospective students, Emory alumni and those who are interested in the history of the area. "Our goal with this project was to create an online experience that would be valuable to a wide range of Emory visitors," Strandmark says. "We were fortunate to have support from so many individuals and organizations to make this project possible. We believe that this will enhance the experience for anyone visiting our beautiful campus." The app provides a recommended route through the historic Emory campus, near the Quadrangle and adjacent to Emory Village. However, users can explore the 14 tour stops in any order on their mobile phones or tablets. The in-person tour takes less than an hour to complete. Those who are not able to visit the campus can take the tour online. The tour was created with OpenTourBuilder, an open-source software developed by ECDS with a grant from the Andrew W. Mellon Foundation. In conjunction with the Emory Campus History Tour launch, OpenTourBuilder workshops will be offered on Sept. 22 and Sept. 23 in ECDS, on Level 3 of the Woodruff Library. Participants can register on the workshops page to learn how to build their own tours on the OpenTourBuilder platform. The Sept. 19 event is offered with grant support from Georgia Humanities.